Creative Studio space with multiple distinct areas. High ceilings and plenty of wall space make this entry room an ideal art gallery. Adorned with vintage light fixtures, and brick & stucco walls, the Gallery is suitable as the gateway to a larger event, or a standalone affair. The Annex is windowed wit egress to both the Gallery and the Factory Studio, making for a fun adjunct theme space with multiple circuted power options, this area also bodes well for hair & make-up, a photo booth, or back of house production . services. Ideal for photography, the Assembly Studio combines multiple textured walls with backdrop frames for alternative scenarios. Create a unique moment in this semi-enclosed space. The 32' wide storage wall is painted with chalkboard paint that can be customized with a logo, and offer event attendees an opportunity to create their own art, express themselves, and share their experience. The Loft space is the best and most exclusive view in the house. A 3/4 bath makes it ideal for artists in need of private prep space, and the open Loft to the Factory Studio allows for luxury and privacy without missing out on any of the action. 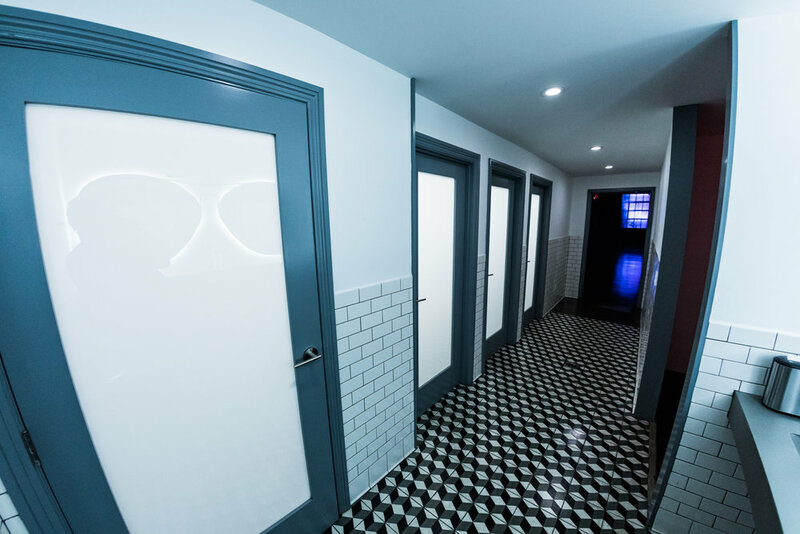 Four private unisex bathroom stalls which includes one ADA stall. These private stalls could also be useful during film and photography shoots as priavte dressing rooms. The grand hall, Factory Studio is bathed in natural light from 5 massive skylights. A vast honeycomb aged wood bow-truss ceiling adds to the warm glow and spectacular visuals. Sand blasted aged brick walls and a 20ft high hedge wall add to the texture and intrigue. All floors are polished with a warm gloss finish that sends light dancing throughout our venue. The 20 car gated lot in the back of VOX Productions creates easy access for services,. a kitchen build out, an outdoor guest lounge area, as well as easy load in and load out. Guest parking is arranged in advance with various private parking lots within 500 ft of our building.